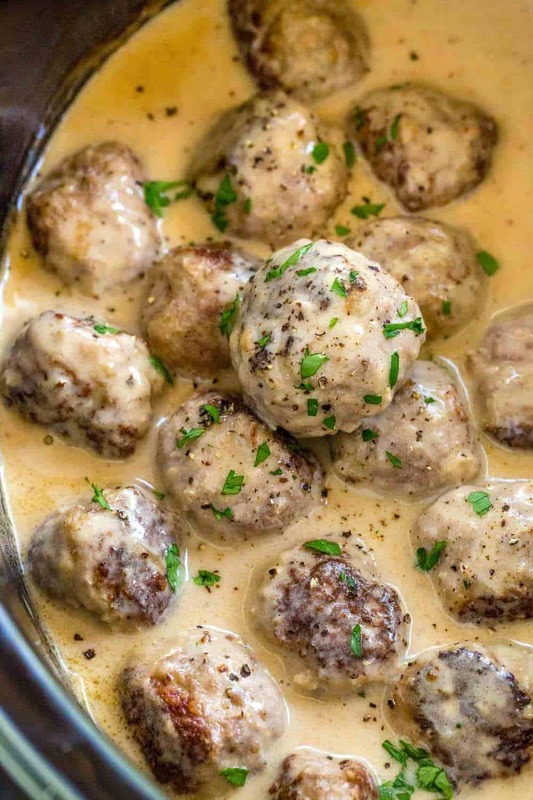 Slow Cooker Swedish Meatballs braised in a rich and flavorful cream sauce. A combination of ground beef, pork, and warm spices make for a comforting and satisfying dish. Serve as an easy appetizer or heartier meal paired with mashed potatoes or egg noodles. Hi there! It’s Jessica Gavin, Certified Culinary Scientist and I’m delighted to share this comforting slow cooker Swedish meatballs recipe with you. There are three key elements to tender and juicy meatballs. This includes selecting the right combination of meat, adding a panade, and simmering over a long period of time under controlled heat. I’ve tested out numerous batches so that you have just the right texture and flavor each time you make the dish. Using an electric slow cooker is the perfect vessel for braising meat over a long period of time. Compared to a stove top, the heating is more consistent and never gets above the boiling point to prevent overcooking. The spiced meatballs simmer in a lightly thickened beef broth, then cream is added at the end of cooking to provide extra richness. Each fork-tender meatball bursts with a hint of nutmeg and allspice. It’s a satisfying meal that requires minimal preparation with virtually hands-off cooking. 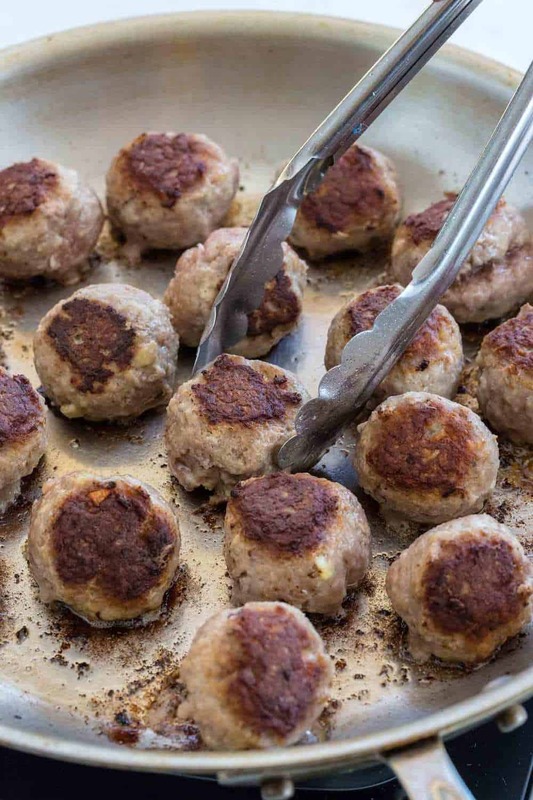 To create meatballs that could easily be cut with a spoon, but have a nice chew, equal amounts of lean ground beef and pork are used. The pork adds a rich sausage flavor and springy texture. 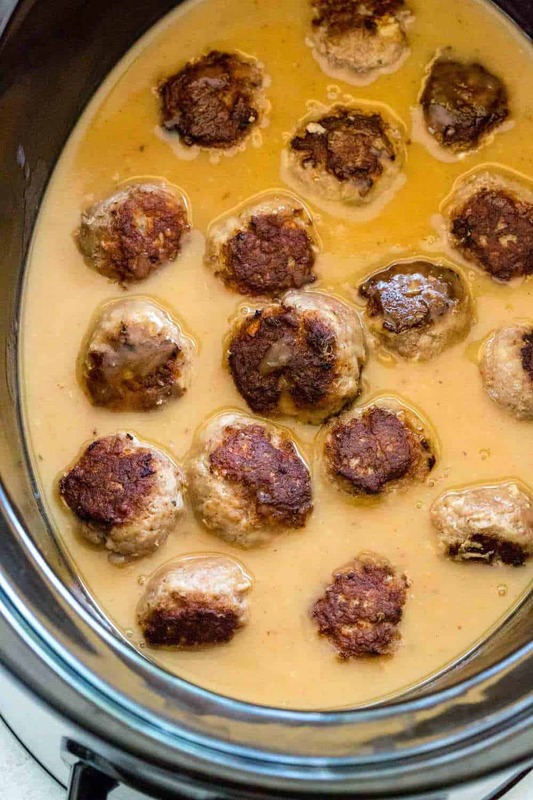 Adding a panade, a starchy mixture of panko bread crumbs, eggs, and cream to the meat mixture helps to bind and lock the flavorful juices in each meatball. Grated onions add savory notes without the crunch you would experience from roughly chopped pieces. What makes this version unique compared to traditional Italian meatballs is the addition of warm spices typically used in baking. The grated nutmeg and allspice complement the creamy sauce, so when you eat them together, the flavors meld and infuse to create a bechamel sauce taste. It’s an unexpectedly appetizing combination, highlighting the flavors of fall and winter. Brown the meat first to develop a more sturdy texture, attractive color, and add flavor. Make a stove top gravy to ensure that it’s properly thickened, then add to slow cooker. Stir in cream at the end of cooking to prevent curdling of the sauce. Gradually cooking the meatballs for about 2 hours on the high setting, or 4 to 5 hours on low, then its ready to devour! You can keep the meatballs in the pot on the warm setting until ready to serve. The slow cooker method of Swedish meatballs is super convenient for making it ahead of time for dinner or parties. I like to serve this dish with homemade mashed potatoes or wide egg noodle pasta. Trust me, you’re going to want to pour the sauce over everything, and I’ve designed the recipe to make a generous amount. Once you make this once, it will be on the weekly dinner menu that will be a breeze to whip up! 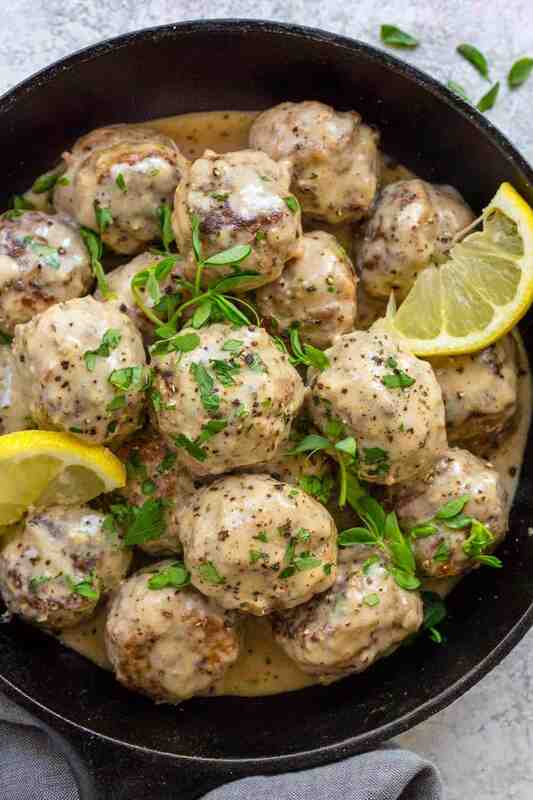 Slow Cooker Swedish Meatballs braised in a rich and flavorful cream sauce. The meat is a combination of ground beef, pork, and warm spices. In a medium-sized bowl whisk together ¼ cup heavy cream and egg. Add in breadcrumbs and stir to combine, set aside. In a large bowl add pork, grated onion, garlic, baking powder, 1 teaspoon salt, nutmeg, allspice, and black pepper. Use your hand to mix and combine the mixture until consistent in appearance, 1 minute. Add in the breadcrumb mixture (panade) and mix with hand to combine until smooth, 1 minute. Add in ground beef and mix with hand until combined, 45 seconds. 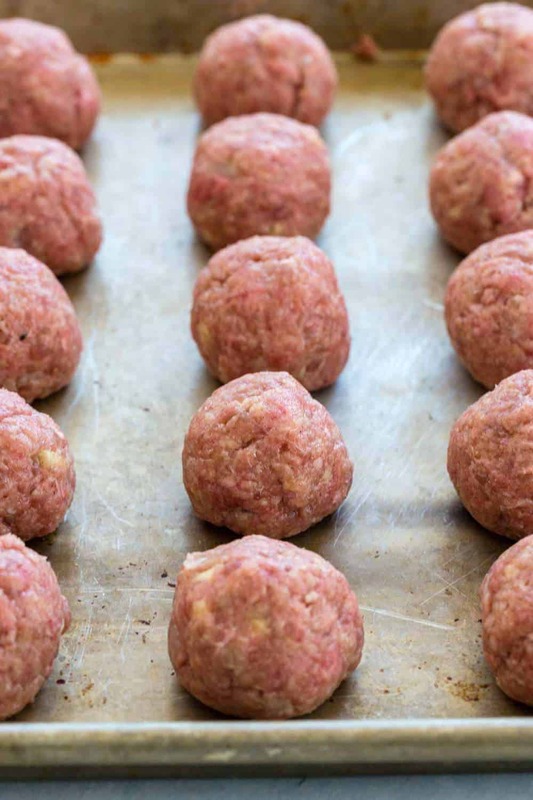 Roll meatball mixture into 2 tablespoon-sized balls, about 17 total. Heat a large 12-inch skillet over medium-high heat. Add 1 tablespoon olive oil, once hot, add the meatball. Brown the meatballs for about 4 to 6 minutes. Turn heat down to medium and flip over and cook 3 minutes. Transfer meatballs to the slow cooker, do not discard pan. Heat pan over medium-high heat, add butter and flour, whisk to combine, cook for 30 seconds. Gradually whisk in the beef broth, scraping and breaking up any browned bits on the bottom of the pan. Bring broth to a boil, whisking until sauce thickens, about 1 minute. Turn off heat and whisk in 1 ½ teaspoons salt, add sauce to slow cooker. Cover and cook meatballs for 2 hours on “High”, or “Low” for 4 to 5 hours. Stir in ½ cup heavy cream and lemon juice. Taste sauce and season with salt and pepper as desired. Garnish Swedish meatballs with parsley, and serve with mashed potatoes or egg noodles. With “Papa” John Schnatter going through a months-long meltdown and his eponymous company suffering the consequences, there appears to be an opening for a new player in the celebrity-fronted pizza-delivery market. Enter Pizzaoki, a new business co-founded by famous disc jockey Steve Aoki, who happens to be the fourth-highest paid DJ on Earth. Pizzaoki launched in Los Angeles, and, according to Forbes, it is poised for major expansion across the country, and, maybe someday, the world. Here are some questions you may have about the burgeoning celebrity-owned pizza delivery operation, plus all the answers. Who is Steve Aoki exactly? Also, his late father, Rocky, founded the ubiquitous Japanese steakhouse chain, Benihana, which is so revered it was the setting for the greatest Christmas episode in the history of the American Office. One might not think a DJ has the required skills to run restaurants, but as he tells Forbes, Aoki already counts himself as an investor in five other restaurants, including a partnership with his brother in Bluetree Cafe, which boasts three locations in Hawai’i. He has the business in his genes. Some of America’s most reliable lifestyle and healthy-recipe magazines will disappear from mailboxes at the end of 2018. Less than a year after devouring Time Inc.’s collection of 22 food and lifestyle magazines, Meredith Corp. is scaling back two of its Birmingham, Alabama-based titles — Cooking Light and Coastal Living. The publishing giant announced today that it will merge Cooking Light with fellow healthy-cooking title EatingWell under the EatingWell brand name. Both Coastal Living and Cooking Light will transition at the end of 2018 from subscription-based magazines to special interest publications available only on newsstands. 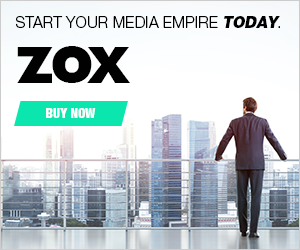 Meredith also plans to outsource the work at its nearly 40-year-old hard-cover book division Oxmoor House. Staff were informed of the major changes today and roughly 200 people were laid off at the publications as a result of the consolidations. The company is providing the employees who lost their jobs severance packages and outplacement benefits. Reached by Eater, a representative for the publisher said that there were no plans “at this time” to merge more Meredith titles. “We will continue to evaluate marketplace needs,” she added. Cooking Light had been in circulation since 1987. The magazine gained a loyal legion of fans during its tenure thanks to its reliable stockpile of healthy, accessible recipes, published 11 times a year. The December 2018 issue will be Cooking Light’s final subscription-based issue. However, Cooking Light diehards will still be able to find their favorite recipe mag online and six times a year on newsstands beginning in 2019. Meredith’s food publication headquarters, which includes Food & Wine and Southern Living in its portfolio, will continue to operate in Birmingham, Alabama, with Hunter Lewis and Sid Evans serving as editors-in-chief. The shutterings aren’t especially shocking. When rivals Time Inc. and Meredith merged last year, some acknowledged that with seemingly overlapping titles such as My Recipes and All Recipes, cuts and consolidations could be in the cards. Prior to the merger, Time Inc. made the major decision to relocate the New York headquarters of Food & Wine to Birmingham, closer to Cooking Light and Southern Living, and turn Lewis’s role into a dual one. Meredith estimates that by combining EatingWell and Cooking Light’s subscribers, it will reach 1.775 million readers — about 80 percent of whom are women — making it the largest circulation in the epicurean magazine category. The new EatingWell will publish 10 times per year beginning with the January/February 2019 issue. It’s been a notably tough few for food and lifestyle magazines. Lucky Peach shuttered in March 2017. In January, Saveur was effectively gutted in a round of layoffs that included the departure of its editor-in-chief and deputy digital editor. For anyone still harboring any doubt about the ferocity of Hurricane Florence, hear this: At least one Waffle House location in the storm’s path is now closed. The 24-hour chain restaurants rarely close, so news that the Waffle House in Myrtle Beach, South Carolina has shut its doors until after the storm passes is a clear indicator that this one’s going to be a doozy. Local news station WMBF reports the restaurant on Myrtle Beach’s Frontage Road is now “eerily empty” ahead of Florence’s expected arrival. Waffle Houses close so infrequently that the Federal Emergency Management Agency uses the restaurants as a barometer for disaster recovery, utilizing an informal “Waffle House Index” to measure the severity of tropical storms and hurricanes in a particular area. Essentially, if a Waffle House closes that’s a sign that a storm was — or in this case, is anticipated to be — severe. Green: Waffle House is serving a full menu and electricity is on. Yellow: Waffle House is serving a limited menu, may be low on food supplies, and is likely using an electrical generator. The National Weather Service has dubbed Florence “the storm of a lifetime”; news outlets are warning that the storm, which is expected to make landfall as a Category 4, will be “catastrophic,” and it’s projected to cause massive inland flooding across the Carolinas and Virginia. Eater has reached out to Waffle House for information on any additional restaurant closures and will update with any further intel.